2 cups (packed) spinach, washed and processed in food processor till very finely chopped, but not quite puréed. In a large soup pot, warm the olive oil over medium heat. Add the shallot, the ginger, the bay leaves, and the rosemary. Stir and cook for a minute or two, until things just start to brown. Add the potatoes and the garlic. Stir, scraping the bottom of the pan for 3 or 4 minutes, then add the lentils and the farro, and continue to stir and cook for another minute or two. Add the white wine, and use it to help you scrape everything from the bottom of the pan. Cook for another minute or two until the white wine is reduced and syrupy. Add about four cups of water. Bring to a boil, reduce heat and simmer for about twenty minutes. Taste the farro and lentils. They should be soft but still have a bit of bite to them – al dente. Add salt, cayenne, smoked paprika and tomatoes. Stir in the spinach. Simmer until the potatoes are cooked, about twenty minutes to half an hour. You might need to add water as the lentils and farro cook. Add the butter and lemon juice. Season with lots of black pepper, taste for salt, and serve. 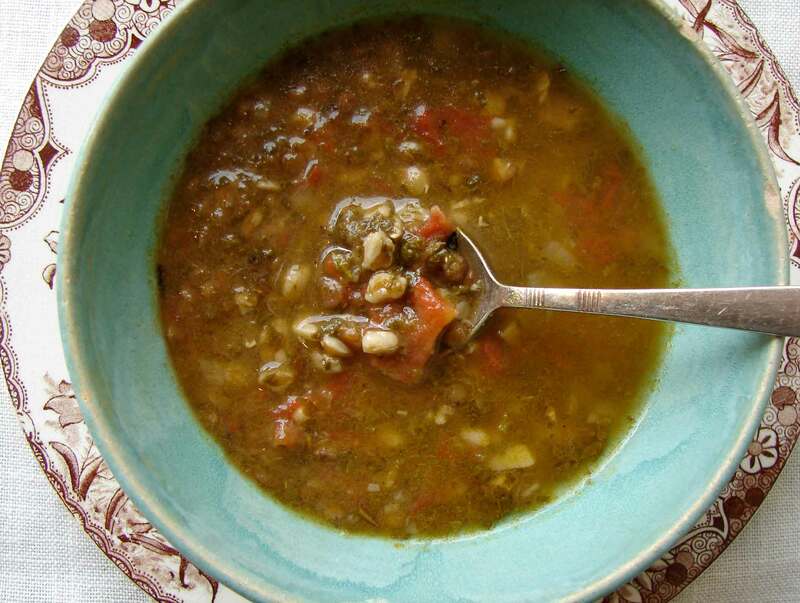 This entry was posted in lentil, potatoes, soup, tomatoes and tagged farro soup, french lentil soup, hearty vegetarian soup, spicy lentil soup by Claire. Bookmark the permalink. 999 It’s a cologne made for guys around the ages of 35 and 53, and should be worn while in the daytime. I’d continue to spend as long as quite possible chopping it up accompanied by a fellow geek, the whilst not providing anything. numerous do not. Never lose the music of your i – Pod no matter what happens. the most latest Mac – Book Pro. Of course, that link is an affiliate link and you’ll get a nice cut of the proceeds. you are knowledgeable in this subject. Well along with your permission allow me to take hold of your RSS feed to stay updated with approaching post. continuous. By this timeframe, it may already cause great damage to your furnishings. NC residents can contact one of several companies to evaluate their mold problem and its underlying cause.